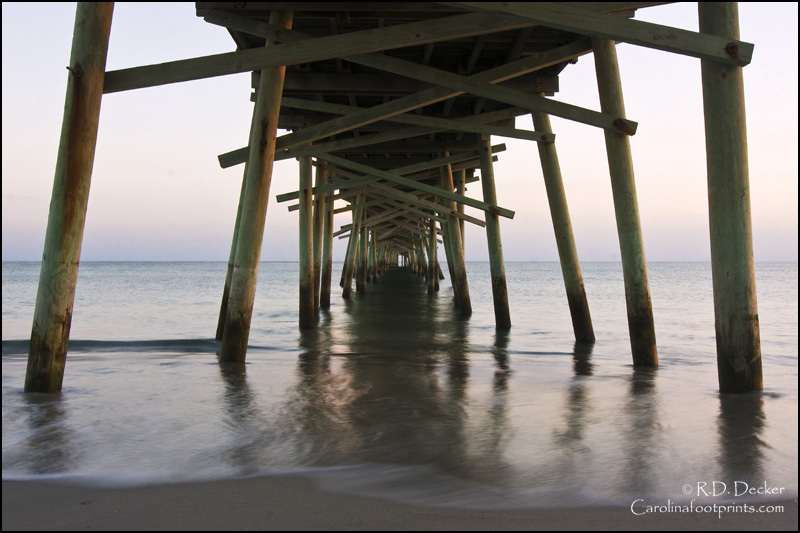 When I moved to the Crystal Coast there were 6 public fishing piers along the Atlantic Ocean; Bogue Inlet Pier, Emerald Isle Pier, the Iron Steamer Pier, the Sportsman Pier, Triple S Pier and Oceanana Fishing Pier. Today there are only two left. This is a trend that’s occurring up and down the coast of North Carolina. For example, in 1996 there were 32 piers along our coast, by 2009 only 19 remained open to the public. This evening I decided to pay a visit to the Oceanana on Atlantic beach. Below are a couple of the resulting images. This entry was posted in General Photography, Landscape Photography, Uncategorized and tagged Beach, Crystal Coast, NC, North Carolina, Outer Banks, Photography. Hi Nancy. Prints can be purchased by visiting the gallery area of the website (http://fineartamerica.com/shop/bob-decker.html). I remember the Harrison fishing pier in Ocean View in Norfolk,VA when I was a kid. I don’t know if it’s there any more, but I wish they would restore some of them. I grew up summers in Atlantic Beach, with countless hours spent at triple s fishing pier. It was so nice to be able to come up from a day at the beach to eat a hot dog or hamburger, to play air hockey or video games; or walk ALL the way out the pier to watch all the old guys flipping squid baited hooks into the surf.. Sadly, it is something my 5 year old daughter will never know. There is nothing for kids to do there, now. You have the beach, and the house, that’s it. The sity of AB even wants to charge 10 bucks for parking at beach access points now. pitiful.